It’s been one month since one of the most empowering and incredible events of my lifetime. I’ve found it difficult to properly put into words just how amazing it was attending the Women’s March on Washington. 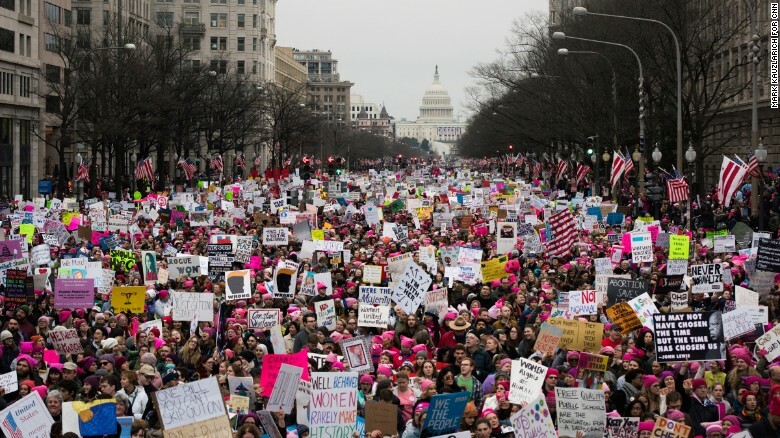 To stand in solidarity with millions of women and supporters of women, not only in Washington but all across the globe, was a moment I will never forget. One of the biggest questions after such a movement was, what’s next? The answer is in the lessons learned from that day. This battle cry heard during the march still rings true. One of the most beautiful moments I remember from the march was when we came up over a hill near the Washington Monument, and all you could see was a sea of marchers. There is strength and solidarity in numbers. Call to action: Stay in touch with people you met at the march or others who you marched with. Follow the march on social media for updates on how to stay involved and information on future marches. Chanting during the march only strengthened our solidarity and allowed for everyone to literally use their voice for the cause. Because so many different social issues were represented at the march, the chants felt like a way to unify the masses. Call to action: Continue to use your voice by calling your elected officials about important issues. I had only recently moved to my neighborhood when I signed up to attend the WMW. Going to the march brought me closer and allowed me to develop an appreciation for the strong group of women living around me. People who had once been complete strangers were making sure that marchers had rides to and from the buses at odd hours of the night, or provided childcare if they were unable to attend. Call to action: Reach out locally. Know your neighbors and join social media groups that can help keep you informed on important issues surrounding your community. The overarching theme of the march was one of empowerment. To march among hundreds of thousands of my sisters in solidarity was one of the most empowering moments of my life. To look around and know that you and the woman next to you wanted the same amount of equality and opportunity for the other was a beautiful feeling. Call to action: Volunteer with a women’s organization in your community, such as women’s shelters or reproductive healthcare help centers. It was beautiful to see how quickly marchers were to help one another. Moms helping out other moms, marchers sharing food with people they had just met on the bus ride to DC. It didn’t matter that the lines to the only restrooms were long, or that some of us found ourselves completely immobile when the march surpassed expectations in terms of turnout, people were patient and kind to each other. Call to action: It’s as simple as being kind, remembering your humanity. I can probably count on one hand the number of times I have felt as tired as I did walking back to my bus at the end of the day. My legs throbbed and my voice was nearly gone, but those feelings were reined in by the overwhelming feeling of gratitude and empowerment. We can’t give up after the march, no matter how tired we become. Call to action: There is so much more to be done and many marches to come. Stay informed, don’t give up, and keep rallying.